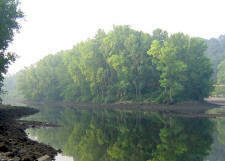 Shelton has more than eleven miles of Housatonic River shoreline, much of which appears forested as viewed from the water, even in densely populated areas. This category includes both the immediate shoreline and the slopes and ridges as viewed from the water. Attributes: VIEW - The shoreline is scenic both as viewed from the water, and as a viewpoint itself, offering vistas of the river. These perspectives may conflict with each other: Clearing to enhance the view from the shoreline often detracts from the view of the shoreline as seen by river users. HISTORY - The river was used for transportation, was the site of early settlements by Native Americans and Colonists, and powered the industrial revolution in Shelton. PARK - Riverview Park, Indian Well State Park, Veteran's Park, Sunnyside Boat Launch, Birchbank Open Space and Southbank Park can all be seen from the river. RECREATION - Boating, fishing, swimming. AGRICULTURE - fishing. SPECIMEN - Bald Eagles and other wildlife. FEATURES - Rocky outcrops, streams, locks, canal, dam. AT RISK - The ridgeline and slope as viewed from the river are at risk of new development as well as existing development seeking to enhance river views by clearing trees. The Ousatonic Dam was built to fill the Shelton Canal with water to power factories in the late 1800s. The dam complex, including the gatehouse, remaining locks, and a portion of the canal, is one of the most recognized scenic features in the City. 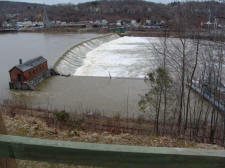 The dam is used for energy generation under a federal license and is open to the public under a lease by the CT Department of Environmental Protection. Attributes: VIEW - The dam complex is scenic as viewed from the river, from the overlook on Riverview Park, and from the downtown riverfront area and future River Walk extension. The area also affords scenic view of the river as from from the vicinity of the canal. 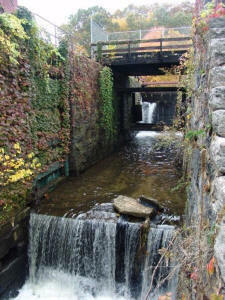 HISTORY - Dam complex allowed for the Industrial rise of Shelton. PARK - Area is open to the public under a CT DEP lease. PUBLIC RECREATION - fishing, picnicking, walking. AGRICULTURE - Fishing. SPECIMEN - Good example of 1800's locks. FEATURES - Dam, Gatehouse, Canal, and locks. RISK - Proposal to fill in canal and demolish gatehouse by property owners pending. 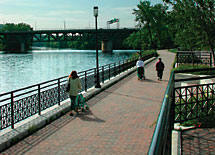 The Shelton River Walk is located in downtown Shelton along the Housatonic River and Veteran's Park. The existing path will be extended to the northwest as part of the downtown redevelopment project. Attributes: VIEW - River. HISTORY - located at site of industrial Shelton and Pootatuck Village. PARK - adjacent to Veteran's Park. PUBLIC RECREATION - walking, SPECIMEN - Willow Trees. FEATURES - The Walk is a feature, also Veteran's Memorial, view of bridges, which are features. This state park is a regional attraction with a beach, boat launch, pavilions, picnic grounds, restrooms, hiking trails, and a waterfall. The fieldstone bridge and retaining walls located on Indian Well Road were Works Progress Administration (WPA) projects built during the depression, while the Paugussett "Blue Dot" Trail was created by the Civilian Conservation Corps (CCC). The waterfall is known as the "Indian Well", the setting of an Indian story similar to Romeo and Juliet. See DEP webpage. Attributes: VIEW - Of river from the beach and an overlook, also viewed from the river. HISTORY - Indian Well Falls, CCC and WPA projects. 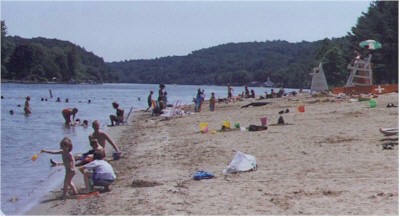 PARK Amenities include pavilions, restrooms, boatlaunch and beach. PUBLIC RECREATION - swimming, boating, picnicing, hiking. 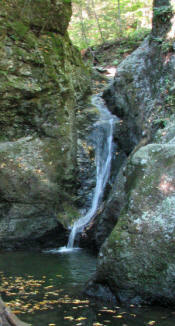 FEATURES - Indian Well Falls. 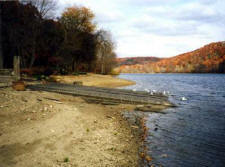 Southbank Park, located on Rt 110 River Road opposite Moulthrop Lane, offer scenic views of the Housatonic River. The 14-acre Sunnyside Open Space, located behind Sunnyside School on River Road, include ballfields, a boat launch, and over 1000 feet of shoreline for fishing or picnicking. Attributes: VIEW - River views. PARK - Ammenities include boatlaunch and benches along the river. PUBLIC RECREATION - boating, fishing, picnicking. AGRICULTURE - Fishing. FEATURE - Shoreline. There are only two true islands located partly within Shelton city limits, both found immediately downstream from the Derby-Shelton dam (photo). The northern island is known as Duck Island. Two Mile Island is technically a peninsula and is currently quarried for sand and gravel, although the banks are mostly vegetated and remain scenic from the river. Wooster Island and Great Flat Island are located off the Shelton shore but are located in Orange and Milford, respectively. Attributes: VIEW - Valued as scenic and as scenic viewpoints from which to view the river. RECREATION: Popular with boaters. FEATURES: Islands are considered features. Currently accessible only by boat, the CRRA Lagoon will be accessible to the public after closure is completed via trails and a canoe launch. See the CRRA Closure Plan. Attributes: VIEW, FEATURE, SPECIMEN - Boaters have reported frequent sightings of Bald Eagles and other forms of wildlife in the lagoon. This rock is located on the shoreline at the Monroe border, and is used by boaters as a warning of rapids further upriver. It is now located on a very small piece of open space. 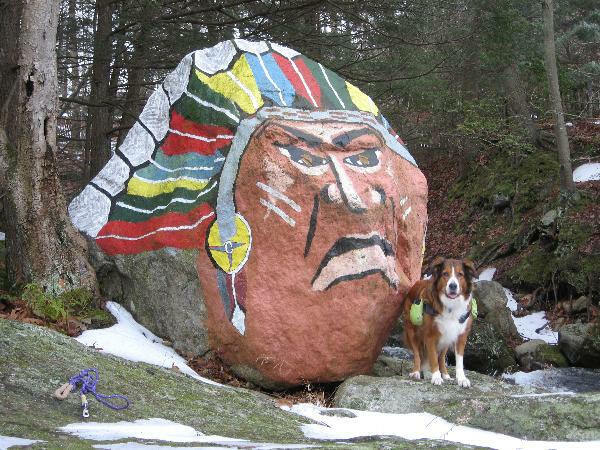 Attributes: HISTORY - The Rock has been painted by residents of "Wholand" for decades and is considered by many to be an example of Americana. RECREATION: Boaters can pull out at this spot, which offers views of the river and falls from a small stream. FEATURE: The rock itself and adjacent falls are features.